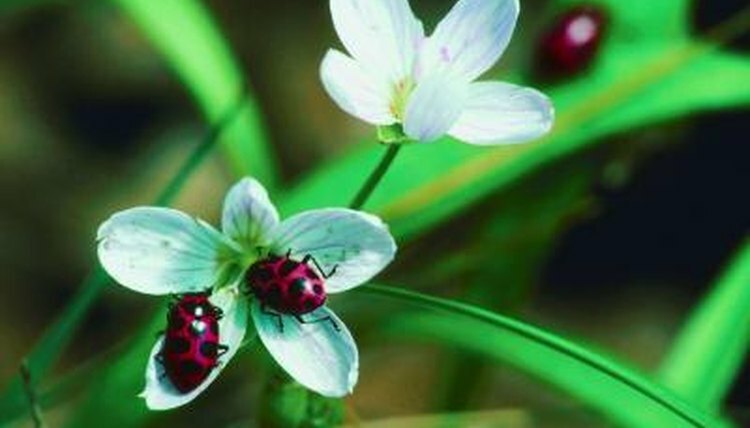 Even if you know little about insects, you can probably recognize a ladybug, also known as a lady beetle. Hippodamia convergens goes through a four-stage life cycle, with the final stage revealing the orange insect with black spots. The length of the pupal stage varies according to food availability. The colorful ladybug lays orange eggs, generally in an area where aphids are plentiful. You might see clusters of these tiny eggs on stems and leaves. The eggs hatch about a week later, with the emerging larvae resembling tiny alligators. The larvae go through four different moltings before forming pupae. Ladybug pupae are -- you guessed it -- orange and black. Larvae don't enter the pupal stage until they reach a certain weight, generally about 15 milligrams. A larva going through its final molt attaches itself to a leaf surface to pupate. Depending on the temperature, it takes from three days to two weeks for the adult ladybug to emerge from the pupa.